CBOE presses pause on Bitcoin futures. Is Wall Street about to get cryptos wrong, again? I don’t have a lot of faith in the Wall Street herd. In fact, that mentality is so strong, they can make a herd of sheep look like independent thinkers. How often have you seen the Wall Street crowd scream “buy” at market tops and shout “sell” at market bottoms? Wall Street is so wrong, so often, that you can make a lot of money by doing the exact opposite. The Chicago Board Options Exchange offered Bitcoin futures trading for the first time on Dec. 10, 2017. The knee-jerk reaction by Wall Street’s finest was to push up the price of Bitcoin by $2,000 within 24 hours to $17,382. 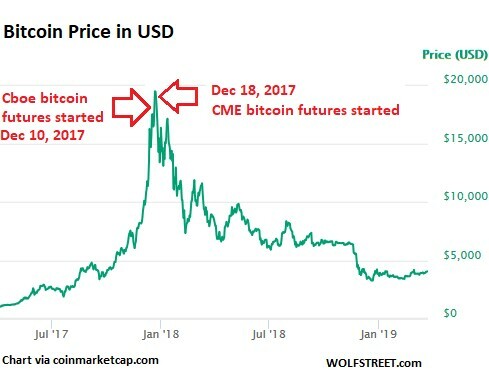 Futures contracts allow investors to bet on whether the price of a commodity — in this case Bitcoin — will rise or fall by a specified date. In true monkey see, monkey do mentality, the Chicago Mercantile Exchange (CME) launched its Bitcoin futures trading shortly thereafter on Dec. 18, 2017. My goodness, the CBOE and CME could not have timed it worse! The price of Bitcoin and other cryptocurrencies peaked right around the same time. In retrospect, the perfect decision would have been to do exactly the opposite and turn bearish on cryptocurrencies. Guess what? You have another chance to profit from the idiocy of Wall Street groupthink today. What I am talking about is the CBOE’s brand-new decision to abandon Bitcoin futures trading. There are still some active Bitcoin futures contracts that expire in April, May and June. But futures contracts expire each month. So, with the CBOE deciding to discontinue the creation of new Bitcoin futures contracts, there won’t be any left after June. That was a short year-and-a-half. The groupthink opinion is that this is a big step backward for cryptocurrencies in general and Bitcoin in particular. In this article, he explains what cryptos are, and why the case for their success is being proven again and again in the markets. That doesn’t mean that you should rush out and buy Bitcoin tomorrow morning. As always, timing is everything, so I recommend that you wait for Juan’s next buy signal before investing your hard-earned money. But the CBOE’s decision is a clear announcement that the next major move for Bitcoin is going to be higher, not lower. P.S. Although the CBOE may be bowing out of Bitcoin futures trading, the CME plans to keep its offering. And the Intercontinental Exchange is planning to offer Bitcoin futures via its Bakkt cryptocurrency trading exchange, starting later this year. The post CBOE presses pause on Bitcoin futures. Is Wall Street about to get cryptos wrong, again? appeared first on Weiss Cryptocurrency Ratings.